This is a book that I've had for ages and am finally getting to. It was recommended to me by a friend years ago and I'm sorry I didn't get to it until now. I really enjoyed the book. 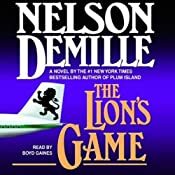 I now have to put the sequel, The Lion, on my To Be Read list, as well as the first in the John Corey series, Plum Island. When artists gather at a remote Appalachian estate for a retreat, they are unaware that their energy is feeding something unwholesome. Sculptor Mason Jackson and dying parapsychologist Anna Galloway must uncover the dark secrets of Korban Manor before their spirits become trapped forever. After parapsychologist Anna Galloway is diagnosed with terminal cancer, she has a recurring dream in which she sees her own ghost. The setting of her dream is the historic Korban Manor, and she's compelled to face the secrets of her soul. Sculptor Mason Jackson has come to the manor to make a final, all-or-nothing attempt at success before giving up his dreams. When he becomes obsessed with carving Ephram Korban's form out of wood, even Anna can't divert his bizarre passion. This was sent to me as a FREE mention. Please double check the price to make sure it is still free when purchasing. Three young people strike out in an old car into the deep desert on a soul-searching roadtrip. Lifelong inseparable friends, each has their own reasons for venturing out into a rarely visited landscape. Lost and nearly out of gas, their car becomes disabled after a freak encounter with an Acme rocket. Forced to forge ahead on foot in the night to get help, the trio sneaks onto a top-secret airbase commanded by a tortured and legendary officer. The group witnesses a spectacular incident between a famous determined coyote and a speedy roadrunner. They realize that the two are not the cartoon characters that they (and everyone else) had thought for decades were - but are in fact real in every sense. The trio are detained on the crumbling base and make a few good friends along the way. They also become aware of a brilliant race of human-like creatures and a secretive tribe of native warriors who live far out in the vast regions of the expansive base. However, trouble is on the horizon. A powerful and angry man wrongfully bent on a terrible revenge gains entry to the base and unleashes a vast private army upon the innocent creatures who are unprepared for war. The invasion forces wreaks death and destruction upon the beings whose choices become to either fight, run or hide... or all three. At the height of the battle, Willie Coyote unleashes upon the enemy the most diabolical machine he has ever constructed. His goal then becomes the most important one he had during his entire life - an attempt to save the most precious friend he never realized he even had. All in all, this is a well polished story. Be warned, it is written in a movie script form, so it might take you a short while to get used to a novel form of narration. Reflections is Available as an Audio Book! Thinking she had learned all the secrets her friends and family could possibly hide, Alex realizes there are plenty more to be found out. Having never been good at telling lies, when she's asked to go undercover she's not sure she can manage the job. Plus, the job is at a strip joint owned by the Russian mafia. Will she be able to keep up the lie? Does she want to? 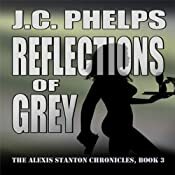 Reflections of Grey is the third book in The Alexis Stanton Chronicles. It is 1953. The Anasazi are in extreme danger deep within the Restricted Area of Mesa Verde. The journal of a past Indian agent is found with entries about the Anasazi and a treasure. Now, treasure hunters threaten to discover and destroy their village. Nothing will get in their way. A spirit, befriended by the Anasazi, asks for Jack Trader's help. He joins forces with Ranger Samantha Baker to stop the threat before it's too late. As a last resort, the Anasazi will take matters into their own hands. They are the 'coyote people,' able to transform with deadly consequences. Three on a Match short story collection, three original tales featuring dirty motives, relentless ambitions, and a lop-sided view of the world. In "The Long Drop," man tries to recapture his youth and assure his future by murdering his present; a killer finds victims aren't always what they seem in "Flowers Street"; and just how does a professional thief get even when he's been swindled by a couple of amateurs in "A Day at the Beach"? If you enjoy gritty, unexpected journeys--sometimes violent, sometimes funny, always entertaining--Three on a Match is for you. Interested? The trip continues in Three Shorts, Three the Hard Way, and Three of a Kind. Her second book, a holiday novella titled "The Christmas Cottage" is currently climbing the Amazon charts. Watching the numbers rise and fall is a daily roller coaster ride but definitely an exciting one! And defeat lies in every fight…. Magic will be that beaconing light! With global warming, animal poaching, deforestation, exploitation and crimes rising at an alarming rate the future of our planet looks very grim. An organisation that works secretly in the North Pole chooses eight-year-old Loli and her cousin Lenny to be a part of their mission. Mission to help and heal planet earth! Destined to be the saviours of our soon to be new age earth, Loli and Lenny's only weapon against the deadly hazards is magic! And they must learn the craft very fast to save one of the most precious but endangered animals on this planet. It all starts one day with their discovery of a hidden secret in Lenny's backyard - a magical secret! From Ipads, tennis and school assignments to wands, cauldrons and powerful spells, their lives change forever. Their first magical mission to save planet earth exposes them to the dangers of the interior most jungles of Africa to encounters with enchanted mystical beings. A fantasy novel for children and middle grade (7 years and above) but with a moral for today’s younger generation! Don’t let them miss it! Three of a Kind is a micro-anthology of three original tales featuring dirty motives, relentless ambitions, and a lop-sided view of the world. In "The Killer," an elderly widow finds the inner strength to protect the last thing she loves from the killer who would take it away; in "Sliver" a small wound becomes a murderous injury; and "Repo Man" gives you a glimpse into what happens when a man is pushed to the edge after his identity is stolen. If you enjoy gritty, unexpected journeys--sometimes violent, sometimes funny, always entertaining--Three of a Kind is for you. Interested? The trip continues in Three Shorts, Three the Hard Way, and Three on a Match.